THIS MODULE IS USUALLY TIED TO THE COMPLIANCE OR TOTAL EVENT REPORTING MODULE FOR TRACKING CORRECTIVE ACTIONS OR RECURRING COMPLIANCE EVENTS. EMAIL NOTIFICATIONS ARE GENERATED THROUGH THIS SYSTEM. USERS CLICK ON A LINK THAT DIRECTLY TAKES THE USER TO THEIR PENDING ACTION ITEMS. 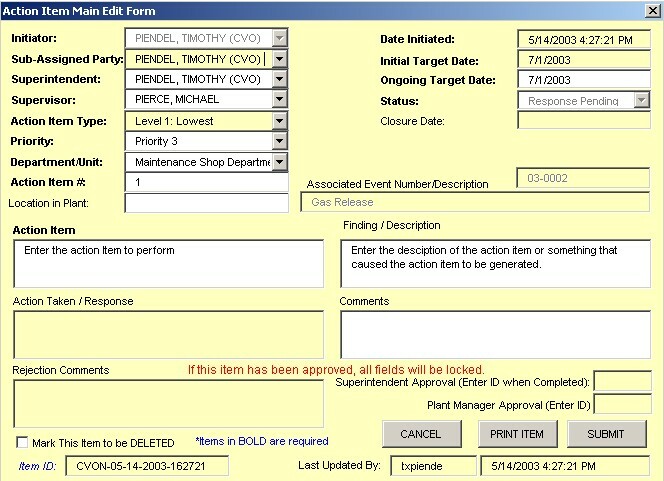 MULTIPLE TRIGGERS CAN BE SET TO NOTIFY STAKEHOLDERS OF CHANGES IN THE ACTION ITEM VIA EMAIL. VARIOUS LOCKING MECHANISMS ARE SET FOR FIELDS TO ALLOW OR DISALLOW USERS TO CHANGE KEY FIELDS. THESE CAN BE SET BY THE ADMINISTRATOR AS NEEDED.